The Pleasanton show ended yesterday, took me about a day to recover. What a show! 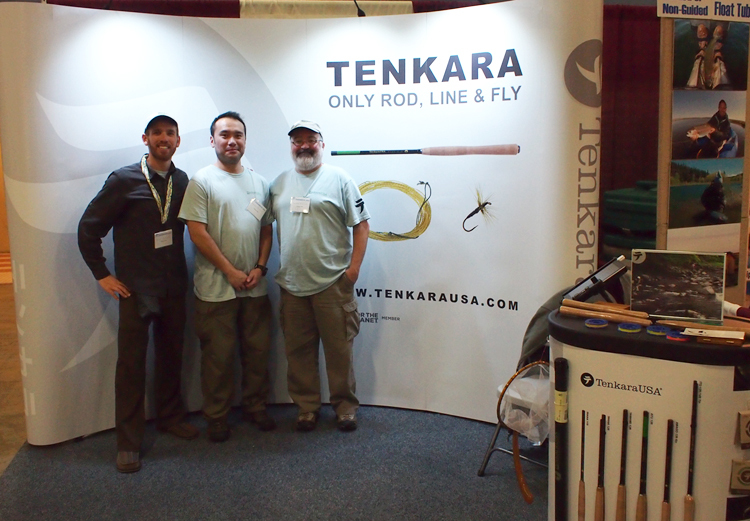 For tenkara, this was the apex of the fly fishing show season, and the beginning of the “year of tenkara”. This time the impression that we had a busy booth was confirmed by multiple reports that indeed we had the busiest booth in the show! Our inventory dissipated like crazy despite the careful planning with experience from previous show. So, yes, I’m stoked – the tenkara community grew considerably this weekend. TJ, our customer service face, and Masaki lent us their very passionate and energetic enthusiasm for all three days. It wouldn’t have happened without their help. They helped customers left and right and allowed me to give a couple of demonstrations or interact with other vendors and friends. A winning team. 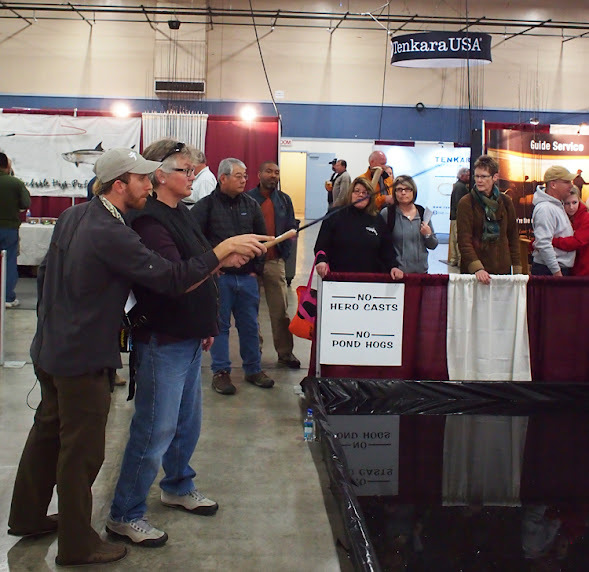 The casting demonstrations again served to dispel the “myth” that tenkara is dapping. I couldn’t keep track of the number of people who stopped by our booth and said, “oh, so it’s just like dapping…”. I would respond that no, it is not, and invite them to watch the casting demo a few minutes later, or take them behind the booth and let them cast the rods themselves. Next up, Pasadena! Please join us next Saturday and Sunday at the Fly Fishing Show in Pasadena. 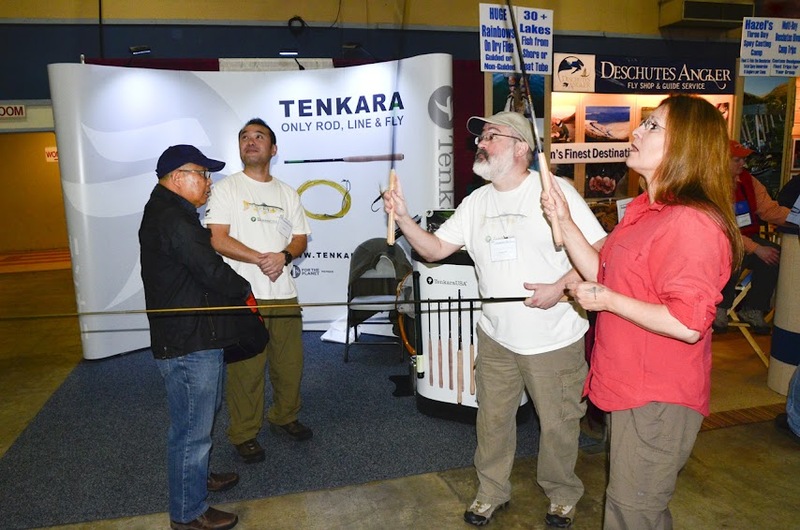 I researched Tenkara before the show and was excited to find out that you were going to have the booth at the Pleasanton Show and even more excited when I found out you would have rods and accessories to purchase. I was there first thing on Friday was able to handle the different rods and ended up with an Iwana and Amago. It was great talking to all of you and picking your brain. I took my son, Max. back on Saturday. His first flyfishing show. You made his day when you asked him to be in your casting demo. He’s excited about Tenkara and “his” rods :). He even tied his first fly there. Tight Lines! Excellent! Thank you so much for the comment and for stopping by to chat with us. Glad you brought max over, especially as it is good to have a kid in the audience – those adults can usually not figure out how to land a fish without a reel as easily as Max did! Hope you guys enjoy tenkara together. We definitely will! We’ll keep you posted on our adventures! Hope to make it to the Summit. An RV trip to SLC sounds like a winner! Thanks again to you, TJ and Masaki for a job well done at the Show! Agreed David. 😎 We all made a great team I would say. Art, keep us posted on your fishing adventures. Make sure to post your tales in our forums. Daniel, it was a pleasure meeting you. As soon as I got home I sent the picture to Mike (Troutrageous) and bragged that I got personal service when I bought my Iwana. It’s Saturday morning and I’ve yet to get out and try the rod because of the recent snow storm, but Monday I’m dragging my friend Yuki out for the test run. Stop by Northern California Trout and see how it went.